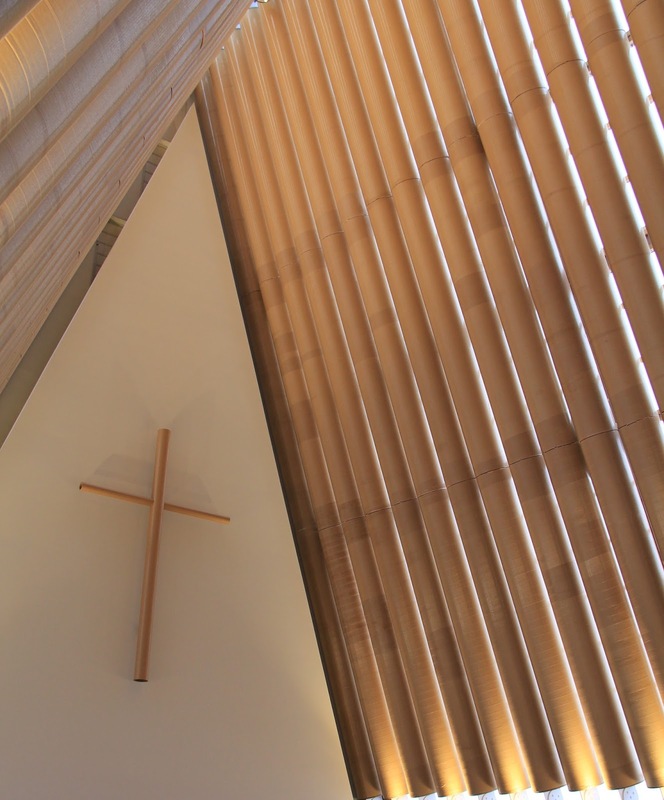 It is quite impossible not to be inspired by the temporary cathedral Christchurch has whipped up. Having lived here for a couple of months, I am somewhat qualified to say, that Cantabrians can be on the conservative side. Which is why something so whacky and irreverent as a paper house of worship pleases me to no end. What I would give to have been a fly on the wall when the idea was first waivered. I am sure the bit where the clever architect explained that the walls would be made of giant glad wrap tubes would have been a highlight. You also simply have to adore the logic that in the event of more “rumbles” it would be one of the safest places to be. Add in the feel good factors of recycling, urban regeneration and you can see how this remarkable project gained momentum. The contrast between the highly symbolic Neo Gothic ruins in the CBD and the cheeky optimistic pop up solution are stark. Perhaps it is the permission to be abit plucky and think outside the square that is the real blessing of a natural disaster. I have avoided the usual spinach and ricotta route, as this is meant to be a celebration of creative souls. Granted this isn’t hugely dissimilar, but it does have more playful flavours and textures going on. My kids happily chow into this, so variations are on regular rotation at our house. Forgive my vague quantities, this is a quickly assembled up family dinner that doesn’t demand precision. 1 leek, afew garlic cloves, a nub of butter, thyme, oregano, loads of parsley, black pepper, salt, a handful of chopped hazelnuts, a handful of grated parmesan, a tub of ricotta. In a large frypan slowly cook the leek and garlic in the butter until soft and tasty, cool slightly. Add in the herbs, nuts and parmesan mix well, and then stir through ricotta. 1 large jar of passata, 1 pack of fresh lasagne sheets, a pot of white sauce if you are feeling fancy and lashings of grated cheese. Pour half the tomato passata into the base of a large baking dish. Add in ¼ or so of water and swish it about to make it ultra juicy. Cut the lasagne sheets into same size rectangles, then working in a methodical fashion, dollop mixture along one side, then roll up to form a cheese filled log. Pop the log on the tomatoey base and get cracking with the rest of the batch. Loosen the remaining half jar of tomato with ¼ cup more water then pour over the filled pasta tubes. If you are going down the path of a creamy white blanket – pour the sauce directly on to the tomato top. Either way dress the top of your dish with plenty of grated cheese. Let it cook away and do its thing in the oven for 40- 45 mins or until pasta is beautifully soft and the top is irritably golden.